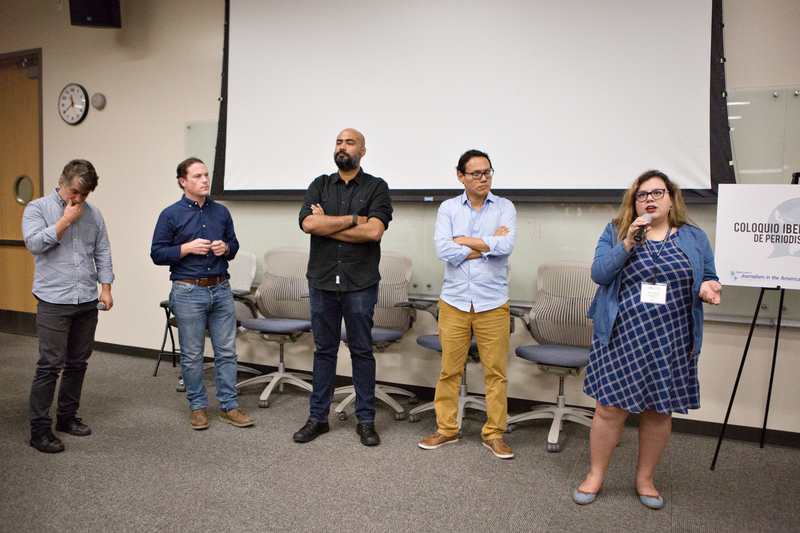 The participants of the event, which took place in the context of the 2018 International Symposium on Online Journalism (ISOJ), shared how they have reported on cases of corruption that have been revealed in the region in recent years, such as the Lava Jato scandal, the Panama Papers, the alleged illicit financing of political parties in Peru or the "Master Fraud" of the Mexican government. One of the cases reported was "The Master Fraud," which revealed what is considered the most institutionalized corruption scheme reported in Mexico. The investigation was conducted in conjunction with Animal Político and recently won the Ortega y Gasset Journalism Award for Best Story or Journalistic Investigation. "Now the information is being criminalized," said Joseph Poliszuk, editor of the Venezuelan site Armando.Info, who along with other members of his team had to travel to Colombia after being sued for an investigation that revealed groups of power that are allegedly doing business with the subsidized food program in Venezuela. "There would be no problem in facing a lawsuit in a normal country," Poliszuk said. "What led to us making the decision to leave preventively for the moment for Colombia was to publish this investigation, which has not ended and there is much more to be said." "It's very important because [the lawyers] review the pieces," Ramírez said. "Many times the consequences of journalism end up being litigated." "That evidently made us very popular in El Salvador," Fagoaga joked. "We received a lot of threats. They invented posts on social networks about the journalist who wrote the article, including that they were going to kill him. Fagoaga said that they obtained protective measures from the Ombudsman's Office for the Defense of Human Rights in El Salvador, but the authorities have not yet complied with them. "You have to handle the security issue," Hidalgo said. "We have talked about several sensitive cases, with which it is crucial to work with data encryption mechanisms." "In another era it would have been unthinkable that it is necessary to review the archives of the public registry of Panama for a Peruvian case but now it is an almost usual thing," Hidalgo said. "We have learned that corruption is like a matrix where everything is interconnected, not only nationally, but globally." In the case of the Mexican organization Quinto Elemento, collaboration is carried out by supporting independent journalists who do not have the means to carry out their investigations. After its first call for story submissions, the organization - which is supported by Open Society Foundations - received 120 stories, of which four have already been published. "It’s very complicated to do investigative journalism in Mexico; the media does not provide support and it is dangerous in some areas, "said Ruth Muñiz, a journalist with Quinto Elemento. "What we do is create a network for those journalists who have stories and don’t have anywhere to tell them or a way to finance them."